As we have previously discussed in our post, Why Sit When You Can Also Stand?, the key to remaining healthy while at work is to alternate between standing and sitting positions. Whether it’s time spent working, driving, eating or relaxing, the impact of our sedentary lifestyle has become an unforeseen health threat. The average office worker sits for approximately 10 hours a day. This doesn’t include the average 7 hours we spend sleeping at night. That’s 17 hours a day! Alternate between sitting and standing every 30 minutes- don’t just do one or the other! Stand up when you are on the phone or if someone comes to your desk to discuss a project. Incorporate stretching or simple exercises into your work day. Don’t send emails if the recipient is in walking distance. Get up, walk and talk. Conduct standing or walking meetings. Intermittent standing during the workday, has far-reaching benefits including improved health, wellness, productivity and satisfaction. So, why not give it a try! 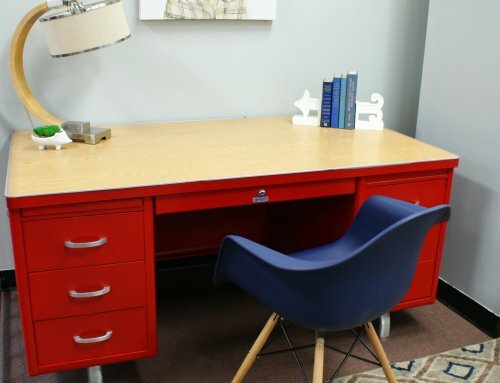 If you don’t want to purchase a whole new desk, try one of our desk toppers like the Volante. It can transform any existing desk into a Sit to Stand workstation. But if you want replace your desk entirely, our newest product, Escalate, is a perfect fit and can be completely customized. With the Escalate, you can pair the dual motor electric base with any top (Available in 8 sizes and 8 colors) – All starting at only $465! The Escalate is of the highest quality at an impossibly low price. It is dual motor, a distinguishing factor that helps with it’s strength, stability and durability, and it can support up to 308 lbs! It has a 4 position memory control keypad that displays the current height in inches, but also allows you to preset the desk at your 4 favorite heights. This means you can adjust your desk to standing, sitting, or perching heights, all with the push of a button! It has the quietest base in the industry (Only 45db.) with a height range of 2′ to 4′. It also comes fully assembled and includes a 10 Year Warranty on the frame and a 5 Year Warranty on the motor. The base can accommodate a variety of size tops (24-30″ deep to 48-72″ wide) which are available in the following 8 finishes: Modern Walnut, Espresso, Coastal Gray, Cherry, White, Mahogany, Maple and Honey. Sitting really is the new smoking. So, don’t just sit there! Escalate your health, well being and energy, plus increase your productivity. Call us, chat with us (look for the blue chat icon) or stop by one of our showrooms for more information. Now available with a custom made, real wood worksurface!